Figure 2. Top: Real cable-driven soft robot, Bottom: Corresponding motion computed by the simulated inverse model. The input of the inverse model is the motion of the robot’s tip. Figure 3. Comparison between experiments and simulation, with hydraulic or air actuation. Figure 4. Experimental setup for trajectory tracking of the soft robot. The robot has four soft arms and is actuated by cables. The simulation model is used as a simulation-based predictor. The 3D position of the end effector can be obtained by the position perception system. 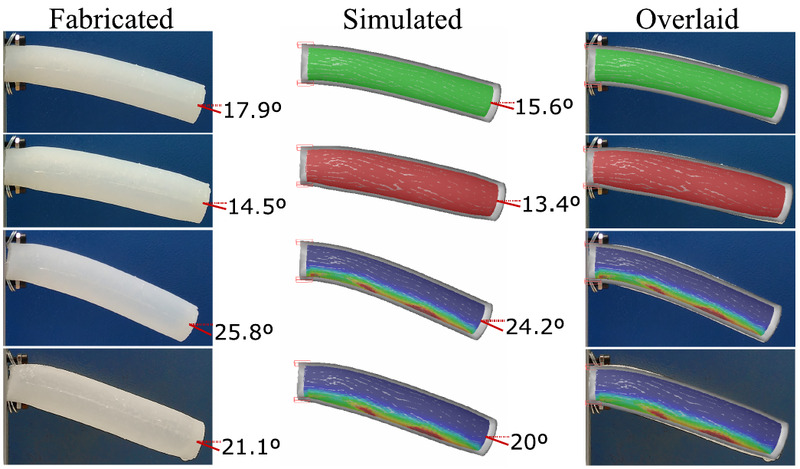 Thomas Morzadec and Erwan Douaille are working on new approaches to model the soft robots' shape. They are working under the supervision of Damien Marchal and Christian Duriez. During this year, they developped a modelling kernel based on distance field function and integrate it into Sofa. The geometrical representation offer several interesting properties that are: compactness and generative. For usability the distance functions are described using the python language then transpiled into more efficient languages (glsl and cython). This geometric kernel is planned for integration into Sofa. 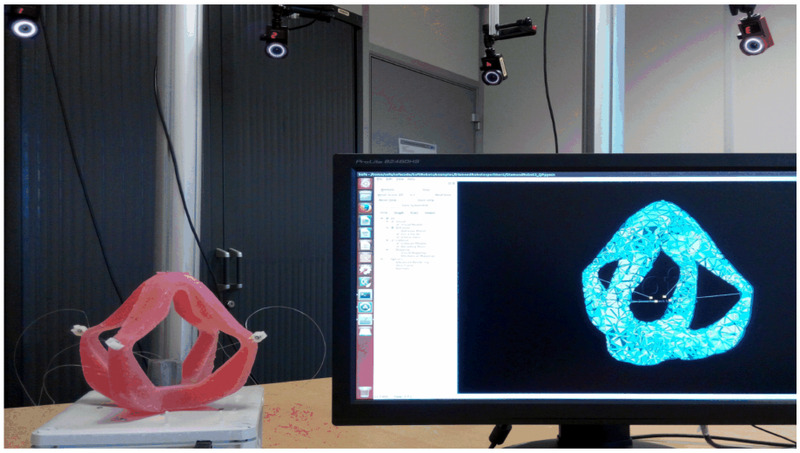 On top of this framework shape optimization are now investigated using genetic algorithms.